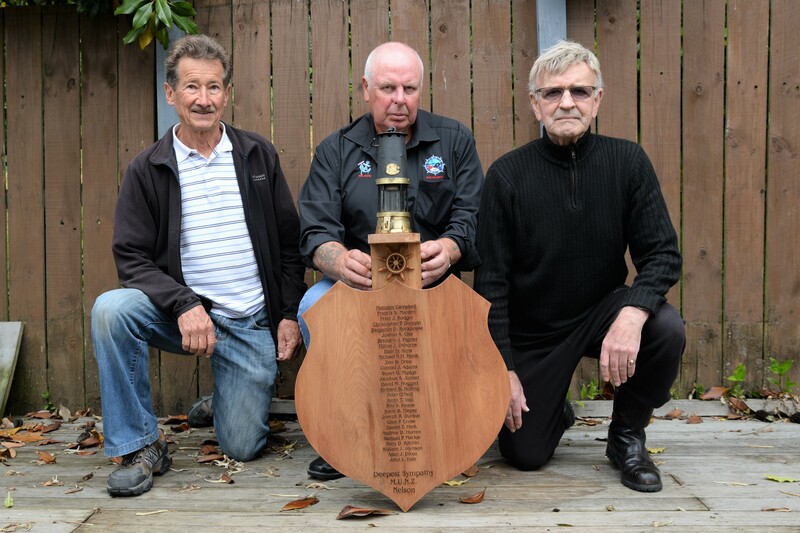 Maritime Union Nelson president Bill Lewis and members Ken Knox and Richard Tidmarsh with the shield the chapter commissioned to commemorate the Pike River disaster. Photo: Charles Anderson. A delegation of Maritime Union members from Nelson have commissioned a memorial shield to take to the seventh anniversary of the Pike River Mining disaster on November 19. Maritime Union Nelson president Bill Lewis said the seafarers would journey to Blackball to honour the memory of the 29 miners who died in the disaster. Some of the families of the men who died in the disaster welcomed the new government’s hope of returning their loved ones’ bodies. Labour, NZ First and the Greens, the parties that make up the new government, announced their support for manned re-entry into the mine. “We offer sympathy and support to the families of the miners,” Bill said. “We too, along with many others, have a sense of outrage about the callous treatment of the affected families … there is now a refreshing feeling that truth and justice will be achieved. The shield features the names of the Pike 29 along with a miner’s lamp fixed at the top. It will be placed on the memorial wall at Formerly the Blackball Hilton. Republished with permission from the Nelson Weekly.